Alright you guys so this is totally my go to bohemian flare look. 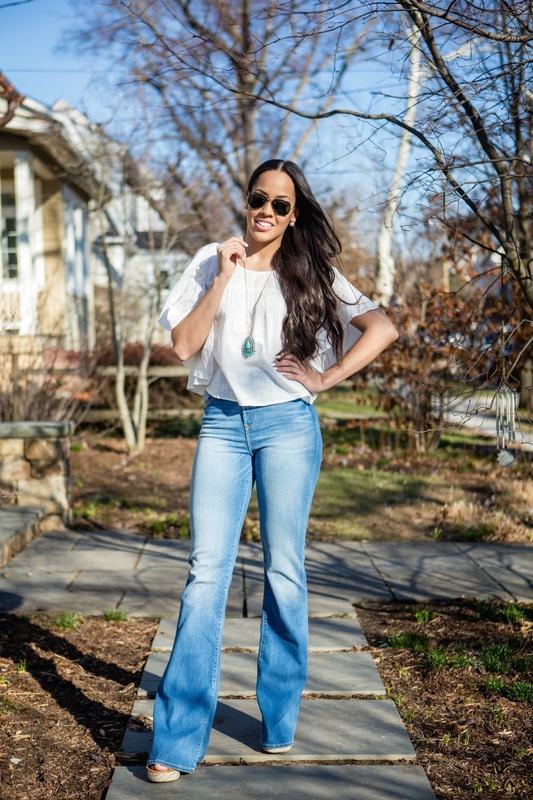 I am loving light wash denim flares with flowy tops right now, the whole look is so breathable to me and with the temperatures rising that is exactly what I want. I've styled this necklace here but you can see all of the looks here, longline necklaces like this are perfect for layering. Did you see yesterdays post? That is actually two necklaces together to create a streamline layered effect, this turquoise necklace could easily be layered for a more dramatic effect. I find that the bohemian style is all about the accessories so layer up the necklaces, make a bold statement with bracelets, and put all the rings on all the fingers! Hey! looking beautiful would like to buy the same outfit for myself. I would like yo buy pink instead of white. Great outfit! You would definitely stand out of Pick Writers for your excellent taste in clothes! Can't wait to see your next outfit posts!